For Executives and Managers, Coaching can make a real difference! Welcome to the Business Optimization Training Institute coaching and mentoring basics programme for senior executives. Our aim is to introduce you to the broad concept involved with coaching and mentoring and management coaching as well as provide you with the necessary tools and techniques to help you develop your skills through a 10 course executive coaching programme of one and a half hours each. Coaching is the interaction that focuses on the enhancement of skills and knowledge. It is a means by which meaningful and powerful conversations and interactions can be cultivated in order to deliver sustainable growth and change. The word mentoring is believed to stem from the Greek word meaning ‘enduring’. It can be defined as a sustained relationship between an employee and a trusted advisor. The mentor offers guidance, support and leadership. Mentoring is also generally regarded as the transfer of experience. In presenting the Executive Coaching and Mentoring Basics Programme, BOTI’s aim is to cover the key elements surrounding the aspects of coaching and mentoring and management coaching to enable you to develop your full potential. This management coaching programme will equip you with the essential tools to develop and implement a mentoring and coaching approach in terms of your own self development that helps unlock key potentials, optimise strengths and counteract weaknesses in order to maximise your performance. In South Africa, the implementation of coaching and mentoring programmes has undoubtedly become a growing trend which has significantly expanded in recent years as many organisations recognise the increased value in retaining and growing key performers. Any change in the business such as organisational development and mergers and acquisitions as well as changes within the organisation mean that key employees need support through a career or role change which mean that they are definite catalysts that encourage organisations to implement positive interventions such as coaching and mentoring. 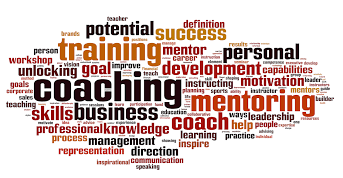 coaching and mentoring processes are focused on the individual, which makes the employee feel valued and involved in organisational change and can result in enhanced morale, improved levels of motivation and higher productivity levels and hence a significant reduction in staff turnover. Coaching and mentoring roles may be undertaken within the organisation or may be provided by professional coaching and mentoring agencies. Bring all the sessions together to create a sustainable way forward.